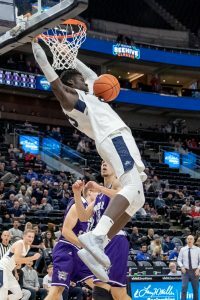 SALT LAKE CITY – Utah State held off a Weber State comeback to win 76-67 and improve to 8-2 on the season Saturday afternoon at Vivint Smart Home Arena. The Aggies led by 18 points in the first half, but had the lead cut to just six in the final minutes of the game. “We’re really happy with the way we responded today against a good Weber team,” Aggie junior Sam Merrill said. 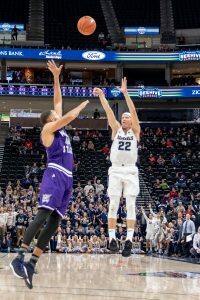 Merrill led USU scorers with 19 points. Diogo Brito had a double-double with 13 points and 11 rebounds. Weber State fell to 5-4 with the loss. The Wildcats were led in scoring by Cody John (16 points), Caleb Nero (15) and Zach Braxton (14). Utah State scored the first nine points of the game and built a 34-16 advantage with 5:32 left in the first half. Weber State’s Brekkott Chapman responded with a 3-pointer before Braxton scored six of the Wildcats’ final eight points of the half to cut the Aggie lead to 39-17 at the break. Weber State continued to chip at USU’s lead through the second half. A 7-0 Wildcat run cut USU’s lead to 10 with 7:24 left. Aggie freshman Neemias Queta, who finished the game with 15 points, five rebounds and three blocks, fouled out with 4:03 left in the game. 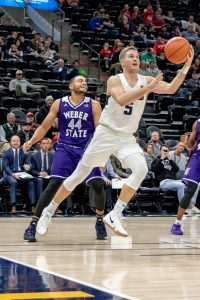 It was shortly after Queta left the game that Weber State cut the Aggie lead to just six, but that’s when another Aggie freshman stepped up. Brock Miller checked in and hit a 3-pointer to increase the lead and slow Weber State’s momentum. Utah State will have a week-long break before hosting Alabama State next Saturday.